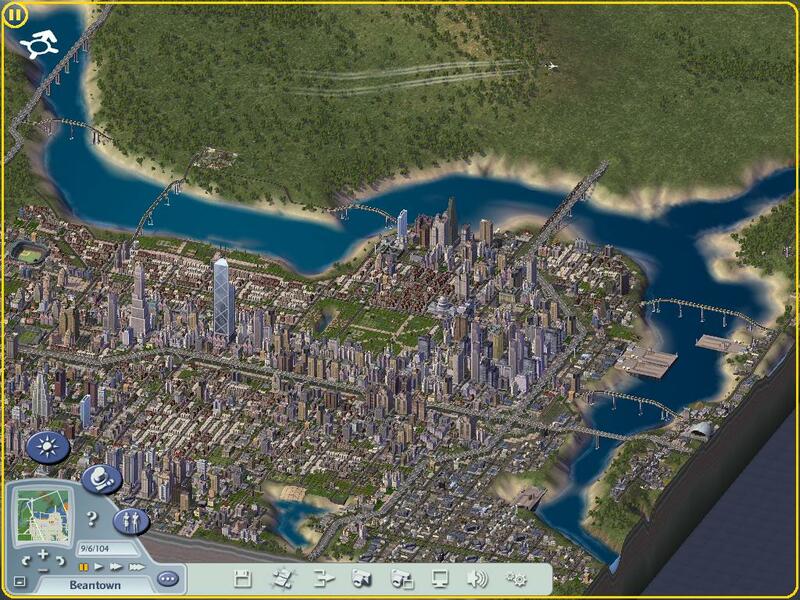 As games can be instructive, SimCity is very much so. I think it should be used in high school curricula to teach civics, and economics, and tax policy. And would that more candidates for public office played it. They might not blurt out so many inane sound bytes at state fairs. Also the music is so cool. I often just let it run in the background and not play the game. Now this probably brands me as a policy wonk–let me amend that; it definitely brands me as a policy wonk–but I have fun noodling with all the various tax rates the game lets you play with. They have rates for high income residents, middle income residents, low income deadbeats. Also rates for commercial activities, farming, heavy (high polluting) industries, light manufacturing, and high tech (low polluting). This is fun to jiggle with to see how it affects growth and the environment. For instance, if you give a tax holiday to high tech industries and tax high polluters back to the swamps from which they crawled, you can raise jobs and revenue and keep the air and water quality clean (and the Sims happy and healthy and approving of your job as a Mayor). But you also need a lot of schools in your city to attract those high-tech industries. The game comes with all of these rates defaulted at 9%, which is where Herman Cain got his “9-9-9” tax plan when he was trying to win the Republican primary back in 2011. I’m sure he just played the game without changing any of those rates, and also probably grooved to the cool music as I do. But the fun is applying your own economic theories to the game as an experiment to see what happens to your balance of payments and economic growth. Of course, the game algorithm was originally conceived by Will Wright, who must be a Keynesian, because the outcomes definitely favor a more actively managed fiscal policy. If you cut all the taxes to zero and let the Free Market frolic, your city soon comesto resemble the scene of a post apocalyptic Cormac McCarthy novel. And cannibalism will reign. Then, before you turn your city on to let it grow, you do one more important thing; you activate a cheat. The cheat for Windows is Alt-X “weaknesspays” Enter (I don’t know what it is on a Mac, look it up). Applying it repeatedly magically floods your budget with money from nowhere. Frankly, I don’t know why this is a “cheat” and not a tool in the game because, when you think about it, this is exactly what the Fed does in real life. It’s what the IMF and the European Central Bank does for countries in default like Greece; making capital out of nothing, allowing for sovereign default, bailing out. It’s also the same as when a country or a municipality issues bonds, or, hell, just runs deficit spending. Nothing bad ever happens except more growth, on and on, just like in SimCity. The only time anything bad ever happens is when somebody decides, based on the Bible or something, that deficits are bad and a country can’t just print money whenever it needs more. Can it? The 14th Amendment to the Constitution says it can (look it up). Also, families don’t get to print their own money like countries can. They can’t use an Alt-X cheat. But the government can. What’s this got to do with the Unbreakable Rules? Nothing. (Unless I can invoke the catch-all Rule #9: Everything is Marketing.) I just wanted to write about it. I am addicted to SimCity, as I’ve said. And tax policy.